Howick local Rebecca Johnson is supporting the Stand for Children charity by selling Cookie Time Christmas cookies. Photo: supplied. A little bit of Christmas cheer this year is thanks to one local cookie seller. Rebecca Johnson is one of 131 Christmas Cookie sellers spreading Christmas joy wherever she goes. For the last few weeks, Rebecca has been selling cookies around Pakuranga and Highbrook. She says not only does being a Cookie Time seller allow her to run her own business, she also gets to make positive change in the community. Cookie Time supports the Dyslexia Foundation of New Zealand and KidsCan Charitable Trust with profits from its annual cookie sales. 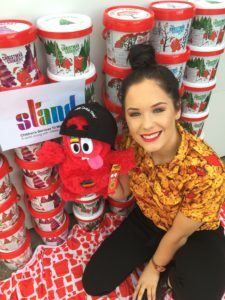 Rebecca has also chosen to raise funds for Stand for Children Charity. Stand works to support children whose social and family circumstances place their education, health and social well being at risk. Stand offers family counselling services, therapy and education for kids, support for families, social services in schools and runs children’s villages across the country. “Stand support families and children who have experienced trauma by hosting them in their villages,” she says. Rebecca says having personally experienced childhood trauma, Stand for Children is a charity close to her heart. “I’ll be visiting the Children’s Village in Half Moon Bay on Christmas week to spread love and Christmas magic to those in need,” says Rebecca. Customers can also ‘donate a bucket’ which will be given to the children and families currently living at the Half Moon Bay Village. If you are interested in buying Christmas cookies off Rebecca before the end of the year you can email her at rebeccaj@christmascookies.co.nz. Rebecca will also be stationed outside the Pakuranga Plaza warehouse on weekends.